In Vanuatu, a grade-taking system enables individuals – usually men – to rise in status and power within their community. Following nomination to enter a new grade, ritual events must be paid for and sufficient 'tusker' pigs made available for public sacrifice. Ceremonies require the wearing of grade-specific ritual paraphernalia and are accompanied by dances, initiations and feasts. Additionally, the initiand must commission a sculpture specific to their grade level. These sculptures are displayed on public platforms during ceremonies to honour the ancestors, and later left to perish and return to the bush. 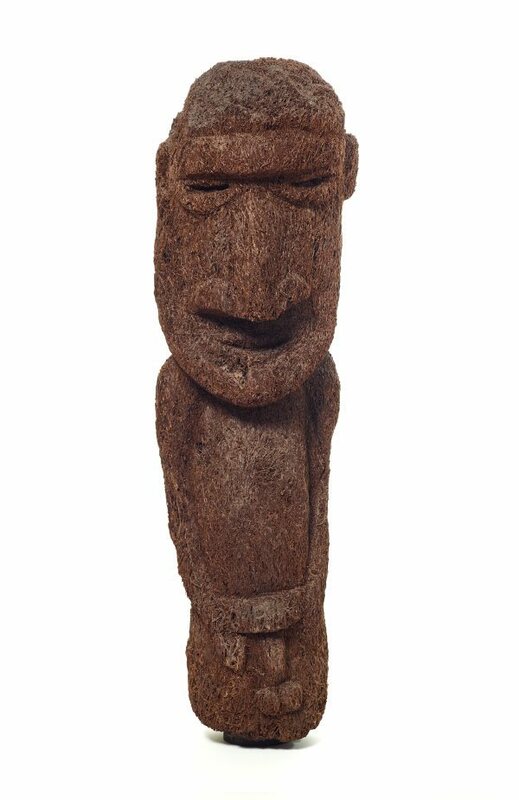 Carved from tree fern, the name and grade for which this figure was made has been lost and any remnants of over-modelling or painted designs covering the surface are no longer extant.